Activate/Deactivate: play or stop audio with an interaction. Playlist once: the list will be played once (here the ‘Loop on Last’ option appears if you want the last clip to stay in loop). Sequence: Only available when there are multiple audios in the playlist. Specify the sequence in which the audios are played. In Order: the playlist is played in the order specified in the UI. Random: the playlist is played randomly. Deactivate: Stop all audio coming from audio source. Audio Source: the audio source that need to be stopped. Fade Out: enable fade out when deactivating an audioSource. The fade duration can be specified. The fade curve can also be personalized. Randomize pitch: if enabled, the pitch is randomly chosen between minPitch and maxPitch each time the audio is played. Fade In/Fade out: The fade duration can be specified. The fade curve can also be personalized. Ducking: Use this to change the volume of a clip depending on whether you are looking at it or not (uses the Gaze condition). 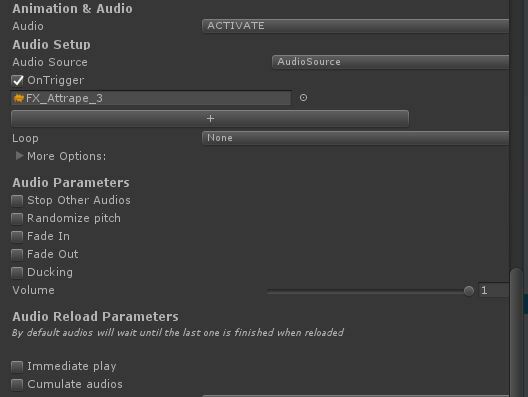 Immediate play: if enabled, the audio will stop and start again when triggered (useful for reload). Cumulate audios (only available if immediate play is disabled): if enabled, multiple audios can be played at the same time from the current interaction. Max concurrent audios: the maximum audio clips that can be played at the same time for the current interaction.